Following Monday’s story about a New York City street artist’s mural on a blank wall at a JBG Cos.-owned building in Rosslyn is news the project is part of a much larger mural push by JBG. The company is commissioning murals for blank urban walls across the region with its JBG Mural Project, to transform urban canvases into public art. The JBG project is curated by National Harbor art gallery ArtWhino. Three murals are in the works this week at L’Enfant Plaza. 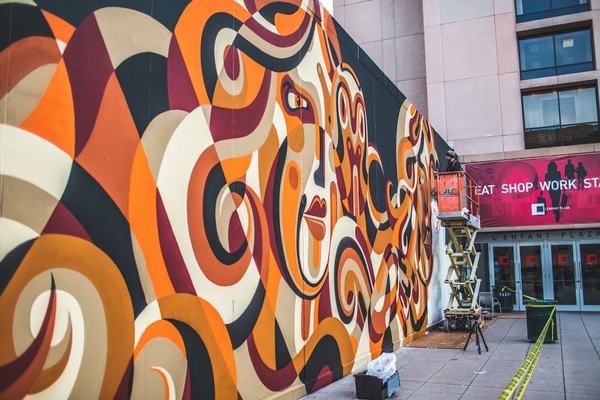 Australian artist James Reka, known for his surrealist street art, is painting a wall mural along the L’Enfant Plaza Metro Terrace. A loading dock wall is being painted by Munich artist Rafael Gerlach, who goes by the name SatOne. And an interior wall in the dining area at L’Enfant Plaza is being painted by Polish artist Nawer. Reka will be painting an additional mural for JBG, an exterior facade at The Shay at 1924 8th Street NW. Two walls at Thyme Square at 4735 Bethesda Ave. in Bethesda will be painted by a yet-to-be-determined artist. JBG plans a total of 19 murals at its Washington-area properties, some of them small interior walls and some expansive exterior works. This article appeared in TheWashingtonPost.com on November 11, 2014. Article by Jeff Clabaugh.